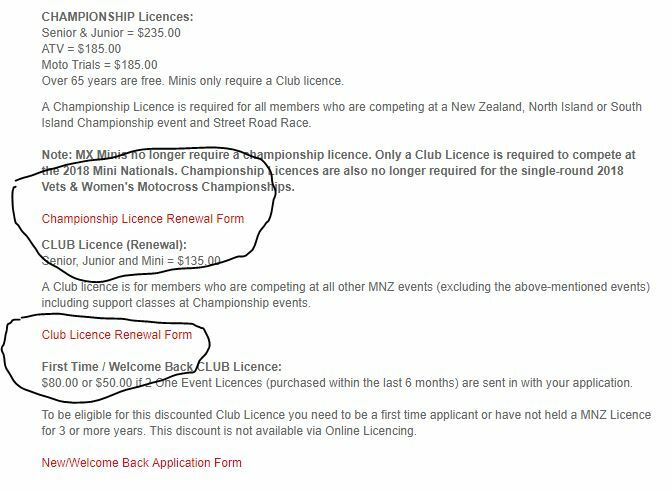 Just a reminder that this year’s MNZ licence needs to be renewed, for all those lucky people 65 and over its free. When you are on that page download the appropriate form by clicking on the circled link. Junior (VCS) Women (VCS) and Side Chair, plus all club trial events. and Social, plus all club trial events. Discounts are 10% for 2 family members, 15% for 3 family members, or 20% for 4 or more family members. Over 65 years of age are free of charge. Club hosting Championship events have the ability to provide at their events a Special Event Upgrade Licence. Notification of this licence being available at events will be made by the host Clubs by way of their en try form.  Competitors must indicate at the time of entering that they require a Specials Event Upgrade Licence. Event Upgrade Licence is being applied for.  Limited to One Special event Upgrade Licence per licencing year. are sent in with your application. licence for 3 or more years. This discount is not available via on-one licencing. There is a short practical test with this form which I am happy to help you with.